1. KK sprints for to set a backscreen for 5. 1) 1 gives to 2 on a dribble handoff while 3 runs along the baseline to the strong corner. 2) 4 and 5 set a staggered ball screen for 2. 2 looks to turn the corner and attack the rim. 3) If 2 doesn't see a driving lane, he can back it out while 4 and 5 set another staggered screen for 1 to curl to the basket. Baseline double needs to hit the shooters defender on the screens. Shooter can choose to curl in instead of straight cut to the corner if they want, read the defender. Having multiple actions in the same play usually ends up in a good shot for your team. By using the ball screen at the top of the key you force the other teams big men to watch the play and be in the help. This allows for the shooter to come off the baseline double for the open shot in the corner. This play is from the 2005-2006 Duke season. 1. 1 dribbles off of 3's ball screen to the wing. 2. 2 cut's off of 4 & 5's baseline double screen to the corner. Option 1 - 1 passes to 2 for a three point shot. Start with 3, 5 and 4 positioned low and 1 and 2 set up high. 1 has the ball. 1 dribbles to the weak side and passes to 3 in the corner. 5 cuts across the lane and up to the weak-side elbow. 2 breaks to the opposite wing area. As 5 cuts high, 4 sneaks in low behind the zone and posts up as close to the basket as he or she can. 3 can throw it to 4 or pass it to 5 at the elbow when the defense closes in on 4 as 4 tries to post up. 2 and 3 cross screen on the inside to create a driving lane for 1. If x5 steps up 1can throw the lob to 4. 1 sends 2 through to opposite corner. 1 passes to 3 who has filled up top. 3 has jumper, 2 in the corner, 4 on the roll, or 5 on the flash. 1 starts left, then reverses dribble right to engage x3. 2 uses double to corner. This is a good isolation set for your 1 player. The 1 player will pass to the 4 player popping out. After the pass to the 4 player, the 1 player will fake the cut to the basket and stop to set a brush screen for the 5 player. If we set a good screen, we can get a layup for the 5 player. The 1 player will pop back hard for the ball. On the pop back, the 1 player can shoot the 3-pointer if the defender is late recovering after helping on the cut to the basket by the 5 player. The 1 player can drive it all the way to the basket on a bad close-out by X1. Put a shooter in the corner to take away the help on the drive. 1 calls "X" to elevate 2. 1 hits 2 and screens 4's defender. 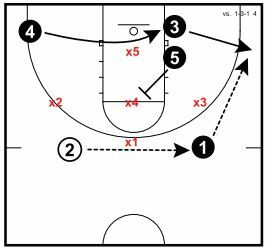 4 cuts to the ball side block looking for the post feed from 2. 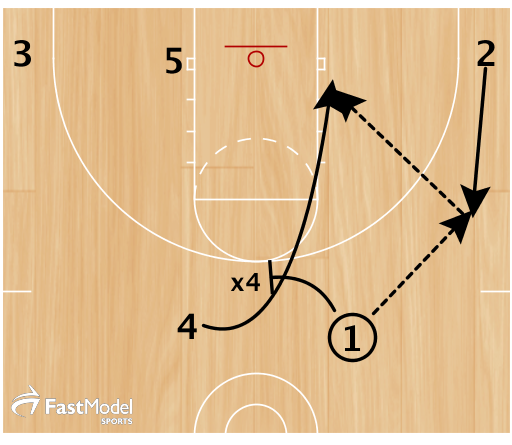 If 4 is not open, 1 pins down for 5 to the high post as 4 back screens for 3 to the ball side block. 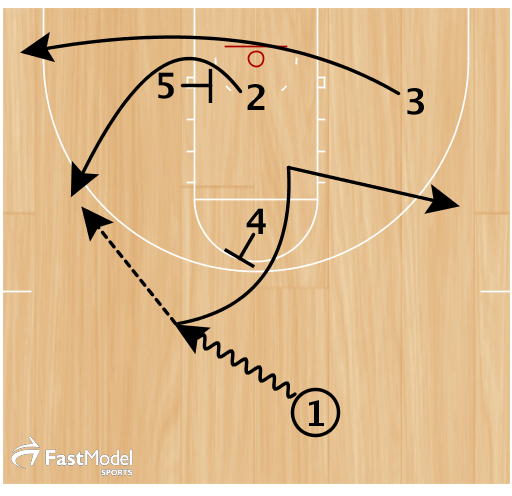 2 can hit 3 coming off the screen or 5 on the high-low to 3. Kobe(2) dribbles down the right side of the floor. Gasol(4) sets a pick for Kobe(2) who comes off to the middle of the floor. Gasol(4) rolls to the rim and if not open, Gasol(4) then comes to set a re-screen for Kobe(2) just inside the 3pt line. Kobe(2) comes off the pick and finds a wide open World Peace(3) for the 3pt shot.